The Premium Alto Saxophone gig bag is the perfect bag for a gigging musician who needs to carry his or her instrument without compromising its safety. This bag is lightweight and ergonomically designed and incorporates the unique "Fuse-on" system, whereby a separate line of accessory bags can quickly and easily fit onto the main instrument bag. Tough on the outside and constructed with robust, non-PVC backed, water-resistant rip-stop material, the Fusion Premium Alto Saxophone bag offers extreme resistance to scuffs and abrasions. 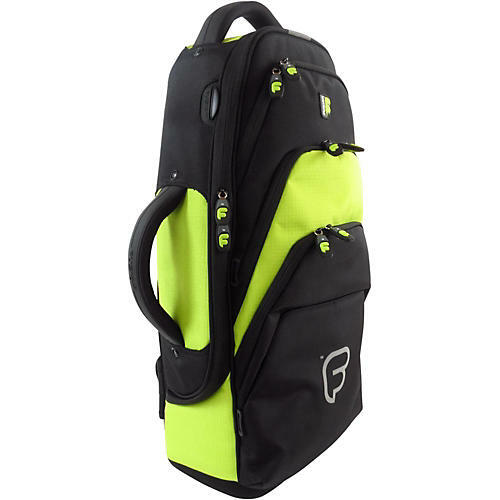 With soft rubber handles and zip pulls, a robust molded base and a rugged finish, the Fusion Premium gig bag is designed to last. They are available in four colors with commuter-friendly reflective panels and print, a safety factor if you are a cyclist or pedestrian. The rear of the bag boasts Fusion's own "Flow-System," similar to that of a hiker's backpack, which makes the bag really comfortable to carry and helps prevent you from getting hot when it’s on your back. There is also a rear zipped compartment where the backpack straps can be stored out of sight when carried by hand. There are added features such as lockable zips on the main compartment of the bag and a rain cover to help keep it dry in wet weather conditions. Your Alto Saxophone will be housed safely inside a 30mm (1.5 in.) high-density lightweight foam shell, the inside of which is made from a soft, non-scratch velvet-mix lining. Along with the provided padded sleeve, this bag will give your instrument ultimate protection. There are three pockets to the front of the bag, one large enough to carry A4 sheet music. There is plenty of space for pencils, reeds and any other accessories you might need. If you want extra space to carry more gear, spare clothing or even your laptop, just "Fuse-on" with Fusion’s line of accessory bags.